I invite you to enter my Maze. I say it is mine, because despite who else I might be, I am the architect as well as your guide. Your first goal is to find the shortest route through the Maze – a simple task, I assure you, if you know what to look for. I have planted clues throughout for your interpretation – or misinterpretation. Indeed, you will be fascinated by the Maze’s ambiguity, stimulated by its mystery, stymied by its riddle. But fear not! I will be with you all the way. Fear not, that is, if you truly believe that my clues or I can be trusted. Enter room 1. Which door should you take from here? Someone in the narrative uses the word “story,” and the same word appears above the door to room 20. Is that the connection? Is there a connection? Give it a try and go to room 20, which is peculiar in its own way. Just inside the door to room 27 you see what looks like the bottom half of an archer’s arrow – an arrow pointing the way perhaps? I will not tell. Perhaps it wouldn’t help if I did. It is up to you to decide, as you move from room to room, hoping that fact is not fiction and that your best judgment has not led you astray. Tempted? Test your wits against mine. I guarantee that my Maze will challenge you to think in ways you’ve never thought before. But beware…one wrong turn and you may never escape. When I turned the cover of the book to my right, I noticed what appeared to be a set of horns and a single eye within the bronze door itself. Looks as though an image of a bull’s head can be seen and from which, a bullnose door knocker and its attached nose piercing, which is also turned to the right of the bull’s nose. I believe that the single eye of this bull’s head, is actually a peephole with a bronze bull head knocker. Could it be that the guide has been using a 1st, 2nd, and 3rd persons perspective, all at the same time? And finally, would a crown door knocker with a peephole, be in reference to “My crown, my pain (knocking of nose ring) , the fire in my eyes.” (people who are looking through the peephole) ? @vewatkin So I took what I thought might have been a clue from “in a number(bear?) of ways” to meaning “in an umbra of ways”. Got to thinking about what could symbolize the fish within a constellation of stars. Came up with “PI – SEAS” (pisces), which also happens to be the zodiac sign that is found atop the lamp in room 7. And if you are the architect as well as the guide, then you are also the incarnation of providence itself, as well as a friend; according to the muse of masonry – LIII or L3 [tune sailor jack] p56. I promise to keep the postings down to a minimum. – W. Brandon M.
Within the 3 paragraphs there are 11 capital letters of ” I ” . If you sound it out, it says, ” Elephanti(z)e “. And if you take the letter ” z ” and turn it clockwise, it will read ” Elephanti(n)e “. Elephantine is an island on the Nile, forming part of the city of Aswan (A swan) in southern Egypt. There are more than eleven but maybe Manson intended for readers to a miscount a little. The result is certainly so meaningful that it couldn’t have arisen by accident. The extras are to help suggest the excess magnitude of an elephant. A gate + π = agate pi – Pi stones are circular in shape, with a hole in the middle. They are also referred to as ‘donut stones’. Pi stones date back to the Incas and are ‘symbolic’ of our luminous bodies and the energetic universe. They can boost your energy, clean your space, attract wealth, enhance your intuition, increase mental abilities, boost your confidence, bring abundance, or even attract love. They were also used to transmit Munay ‘Ki’ Rites during Inca Shaman initiations. Their geometric shape is called a ‘Torus’ and they symbolise the circular path that the sun follows in the sky. The hole in the middle represents the principle of absolute oneness. It symbolises the eternal unity of all things – the cycle of life, death and rebirth. In many ancient cultures, Pi stones were used as ‘star gates’ and ‘energy keys’. They are powerful tools in learning and in healing. Kinda goes together like ‘donut and hole’. 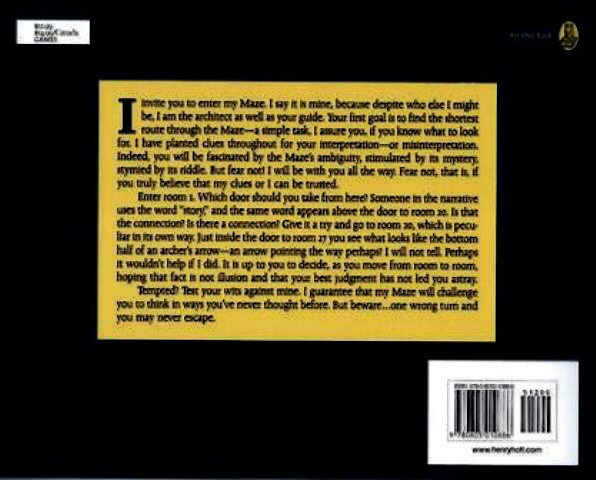 I’m not sure whether this is an accident – it’s a fairly common one, but still, this is MAZE – The back cover says, ‘Indeed, you will be fascinated by the Maze’s ambiguity, stimulated by its mystery, stymied by its riddle.’ There are no apostrophes between the ‘T’s and ‘S’s of ‘its mystery’ and ‘its riddle’. Same in ‘peculiar in “its” own way’. Anyway, just throwing that out there to what you guys can make of it! Welcome to the Maze community! “It’s” a pleasure to net your acquaintance! The contraction “it’s” has an apostrophe, the possessive “its” does not have an apostrophe. There is no accident there. Technically, a possessive is a form of contraction, but people are using apostrophes with them less and less because of texting. There is no plural “its”. The plural of “it” is “they”. If you want to say “it is” but shorter, you need an apostrophe. If you are trying to say “the X that belongs to it” you use “its”. This is the use of “its” in the passage you quoted. Ignore Lewis’s trolling, the Maze community is usually more helpful than this. Hey, at least I’m learning something I didn’t know about punctuation! It could be referring to a Barramundi or maybe that of a Tilapia. You know, sometimes within a door, that is usually made for rented out apartments or hotel rooms, a “peephole” allows the person behind the door the security of seeing “outside” without having to physically open it. Some of these peepholes are often fitted with a “fisheye” lens to allow for a wider field of view, from the inside and little to no visibility from the outside. I wouldn’t be surprised, if that is what MANSON had intentionally hinted at to begin with all along. Would that be a short perch of around 5.5 yards? 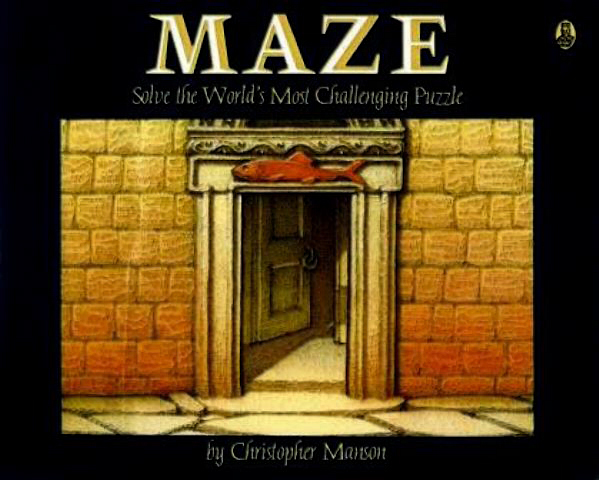 The all-caps title of this book “MAZE,” when converted into numbers is 13 – 1 – 26 – 5 . Added together, you get 45 – the entirety of the maze is contained within the title. Just wanted to offer my two cents while this puzzle is peaking my interest. It’s interesting — this extremely pleasing alphanumeric observation has been pointed out before and it just seems like it must be intentional — but then what do you do with the fact that Manson originally wanted to call the book “Labyrinth”? He had to take out a few dozen pages when he changed the name. Perhaps your observation is part of the reason why the title was changed from Labyrinth to MAZE. I simply cannot believe that something as specific as this is a mere coincidence. “Maze” is the most obvious (and perhaps only) literal synonym for “labyrinth.” It’s a coincidence that the eventual title related to 45 even if he realized what the alphanumeric encoding of “maze” was before settling on that title, since choosing that title flowed naturally from the unavailability of the desired title. Or, to put it another way: It’s the same remarkable twist of fate that the title ended up encoding to 45 whether Manson realized it or not, because the circumstances that led to “Labyrinth” changing to “Maze” were independent of that. Note that Manson also used 45 text/image pairings in his next two puzzle books, suggesting there’s something else going on with Manson and that number. I think we take precisely the opposite of the correct lesson from this information if it bolsters our conviction that apparently meaningful alphanumeric conversions should always be assumed intentional. This book used to give me nightmares. I remember going through it 20 years ago and it vexed me. Every time I came across a revelation, something obnoxious or scary would happen, breaking the silence – phone ringing at 11pm, a knock on the door, TV turning on by itself. When I finally successfully mapped the path, it crackled thunder/lightning outside. I wish it was made up, but it was too coincidental. there is evil in this book. I haven’t thought of it in years. Then I came across this webpage just this week, and immediately had nightmares about Maze again. Welcome back to the creepiness! The top and sides make a pi symbol. Dont know why. If the goal upon entering the maze is to get out of the maze by the shortest route possible, then I chose not to enter and thus achieve the goal. I also believe that entering the maze is entirely a literary red herring. I also believe the shortest route out of the puzzle is to not enter at all. The solution is not just the shortest route but a 16 step route. However I can’t fault your logic that the actual shortest route is zero steps, skip the MAZE and go out for pizza. Did someone say this elesewhere? The back cover has “peculiar” broken out as “pecu-liar” so that “liar” is on its own line. And the guide did just sort of lie to us about the best choice. Interesting, it is also the only hyphenation on the page. 2. The cover shows a plain open door. The prologue door is closed with a bottle on it. 3. The light shifts so it shines on said door. A fun little riddle? Hmm…. Well, an obvious thought is that on the cover we see a point later in time than on the prolouge page. In my discussion of time in the Maze I conclude that the door to the Maze faces East and we look to the South, and that it is 8am in room 1. The fact that the sun on the cover has moved as the morning sun would strengthens this idea. The fact that the door is open on the cover suggests that this is the way the guests went. That is the wrong way, of course. Not the worst choice, but wrong. We could tie the appearance of the red herring in with this and say that the open door is a red herring. And then I have my old existing theory about the red herring and the umbrella. But that’s all I got for now. I see through the doorway on the cover that the door is slightly open, and yet on the prologue it is closed. I always used to think and still think that in this that other than the normal path, you could go a separate way, maybe along the trap or loop, maybe on no particular path at all, that you’re chasing someone. In room 44, they mention that they don’t know who left the door open, and by quickly checking, it becomes obvious that they didn’t come in through that way. Even on room 34, you can clearly see a man leaving through the door to 25. The Red herring, the only part of the book that is in color, indicates that the light shining through the entrance into room and onto the room 41 doorknob, and only room 41, is a red herring, hence a wrong choice. The entire MAZE is a red herring. The real puzzle lies outside of the book. Anybody have any idea what the fish means? It has always seemed to have a confused look on its face.